In the 1790's Quakers settled around Adolphustown and shortly afterwards started to settle westward in Prince Edward County around West Lake. A number of meetings were established and after 1821 they were under West Lake Monthly Meeting. Collectively, the meetings in the area are usually called "West Lake". Adolphustown Prepararatory Meeting was the first to be established in Upper Canada in 1798 under New York Yearly Mtg and initially under Nine Partners Quarterly Mtg, NY. It became a Monthly Mtg in 1801and was laid down in 1821 and became a Prep Mtg under West Lake. In 1828 the Friends split into two groups - Hicksites and the Orthodox. It was a difficult time and in small communities it meant deciding who kept the old meeting house, burial ground, minute books and registers and who had to start new in the same area. In 1881 a further schism resulted in the formation of the Conservative group. Prior to 1828 they were all one group. Arthur Dorland, Quaker, professor of History at the University of Western Ontario, has written the best history of the Society of Friends in Canada. Originally published in 1927 and revised in 1968, The Quakers in Canada, A History. The book details the settlement in Adolphustown and then westward around the Bay of Quinte. 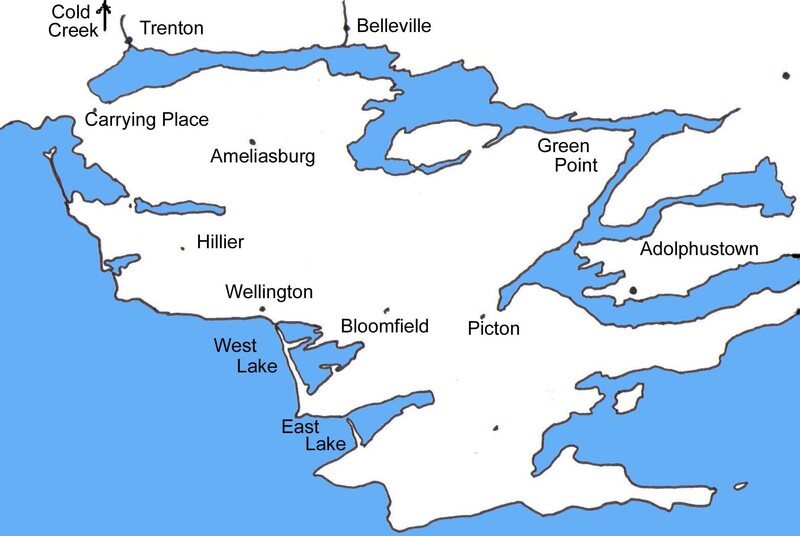 The book also accounts for the settlement of the other regions of Ontario. Copies are still available from the Archives. These various Preparatory Meetings below were under Adolphustown till 1821 then under West Lake after that. West Lake: Prep Mtg 1803; Monthly Mtg 1821. The largest collection of Canadian Quaker material is at the The Quaker Archives and Dorland Library at Pickering College in Newmarket, ON. The Marion Cronk Fonds is at the archives in Pickering and the Rachel Cronkhite Fonds is at the Archives of Ontario.